Create your own fairy tales with this mystical one-winged creature - Pegasus. 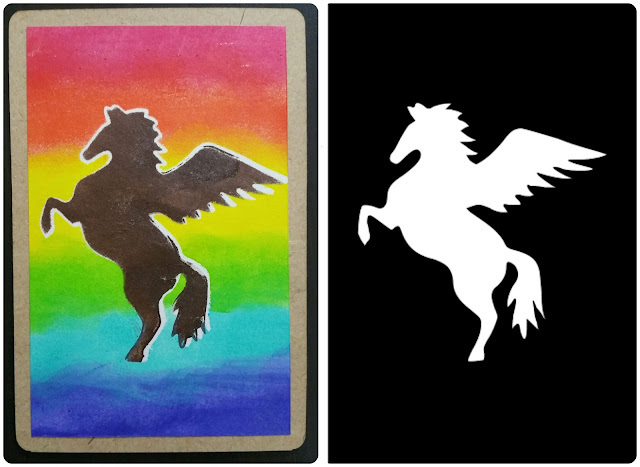 In Greek mythology, Pegasus is a winged divine stallion usually depicted as pure white in color - but with stencils, you can use any color you fancy! Stencils are very versatile and can be used for card making, wall painting, decorative painting, creating patterns, mixed media art - masking, embossing etc. You can also mix and match your stencils for unlimited creativity! Stenciling is a mixed media art technique for reproducing designs by passing ink or paint through the cut portion of a stencil onto the surface to be decorated. In paper crafting, stenciling is the most cost effective way to add layers and dimensions to your projects with minimal efforts. The best thing about stencils is that it is easy to replicate the same design over and over again.You can also create repeating patterns on a variety of surfaces. 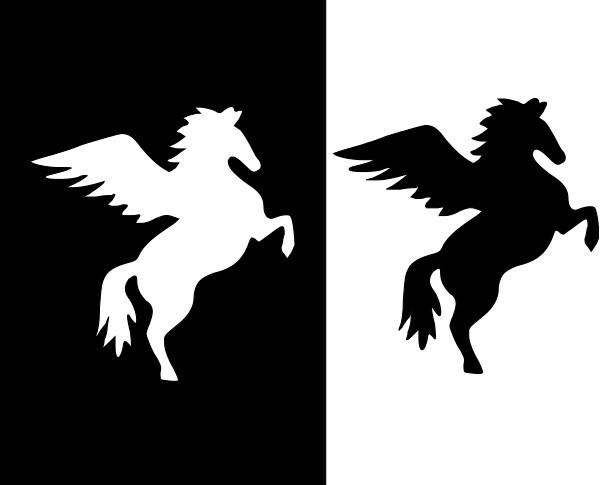 The Pegasus stencil illustrated here has been designed and manufactured in our studio. It is cut from a clear acetate sheet that is reusable, washable and flexible. With proper care and cleaning, you can use it a thousand times. The stencil has no adhesive backing so it will need to be held tightly or adhered to the surface you want to stencil using a repositionable spray mount or pieces of tape. This stencil design has 2 parts - the negative and positive. The large stencil with the shape cut out of it is the negative part and the shape itself is the positive part. Stencils can be used on nearly every surface and every medium imaginable. Paint on wood, ink on fabric, chalk on paper, glitter and thick mediums for your scrapbook, spray paint on your furniture, even frosting on your cake! It all depends on your application needs or preferences. There are special tools required for stenciling however they need not be fancy.